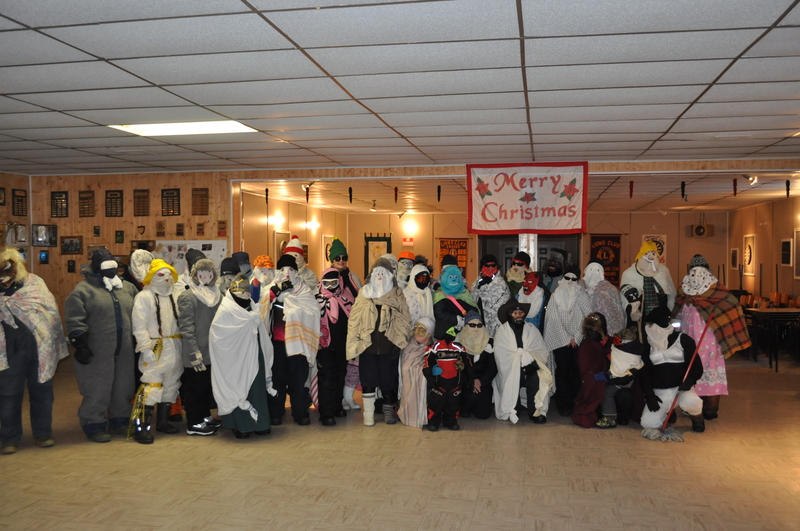 Nearly forty mummers braved a -16 temperature with a wind chill that reached -31 to keep the tradition of mummering alive and well with the 4th Annual Mummer’s Walk at the Green Island Cove Lion’s Club. Mummers came from near and far from communities of Anchor Point, Savage Cove, Flower’s Cove, Green Island Cove, Green Island Brook, St. Lunaire-Griquet and many citizens from surrounding communities visiting the Lion’s Club, such as Sandy Cove, Deadman’s Cove and even from mainland Canada to see what the Mummer’s Walk so all about and enjoy the fun! The rig-up started shortly after 2 PM and just after 2:30 PM, Sabrina and I started the event noting the original idea of hosting a community event that would bring people together and would encourage more active mummering in rural Newfoundland & Labrador, especially since we remembered large groups of mummers from our childhood. The first was held in Flowers Cove, followed by Anchor Point and last years was in Savage Cove. 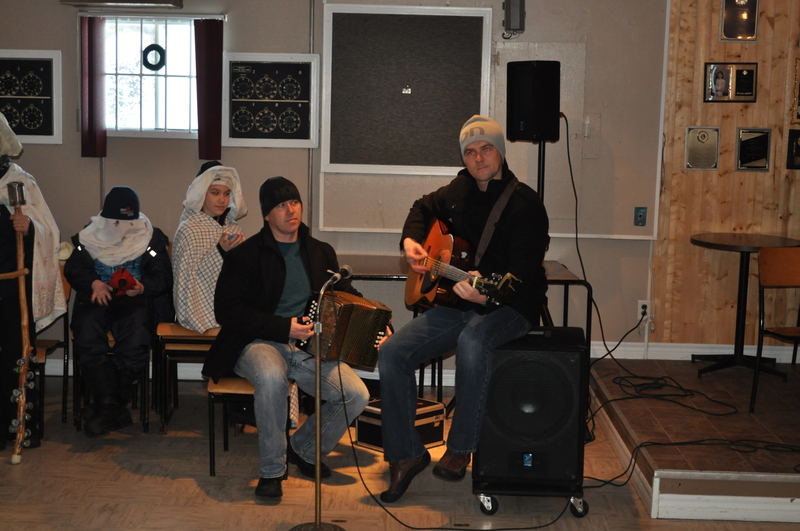 This years event all started with the talented Way Brothers performed a couple of traditional tunes on the guitar and accordion, including the famous Simini tune, “The Mummer’s Song“. The group broke out into dance on the floor. It was great to see such a crowd turn-out and participate in the Mummer’s Walk and a number of youth watching the festivities. These are the future generations to learn the tradition and pass them on. The residents, especially seniors were perched at their windows anxiously waiting for the long line of mummers to pass by their homes. They were people waiting in vehicles, residents waving from windows or door steps, excited to see the large group of mummers. A group this large, likely not seen for decades in the community of Green Island Cove. The walk was a lot of fun. We would all return to the Green Island Cove Lion’s Club and have hot chocolate, Purity Syrup and Chocolates for a treat. It was a great time to mingle and talk about going mummering tonight or another in Christmas. So if you hear knocks on your door, please let the friendly mummers into your home and enjoy the tradition that is forever in our hearts and souls, making rural Newfoundland and Labrador that perfect place to celebrate Christmas and the place we call home. A big thank you to all who took the time to dress up and participate, the Green Island Cove Lion’s Club for providing the venue, all the visitors who came to the event and watch, Ryan and Monty for playing a couple of tunes, Loomis for coordinating music, logistics and bringing lots of spirit and to anyone else who helped in any way. I encourage you all to go Mummering this Christmas. I’ll be doing my part to continue to keep the tradition alive. 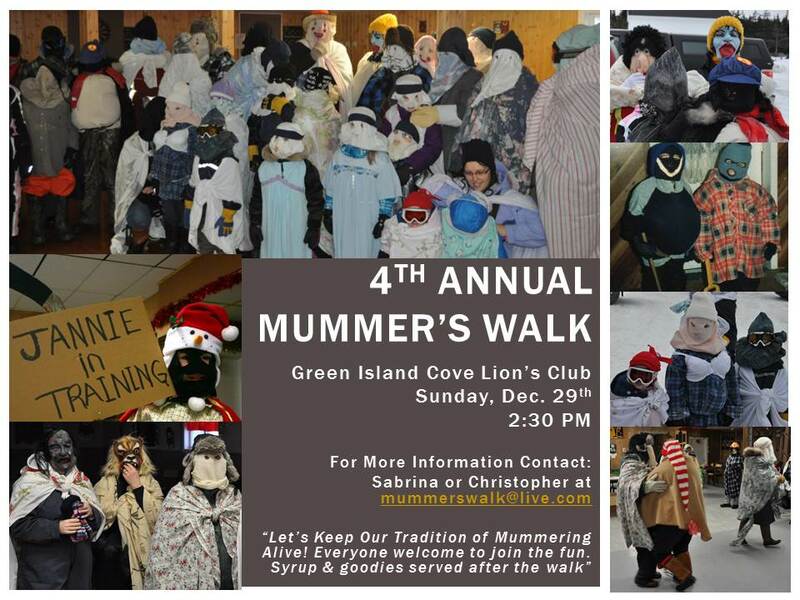 We’ll keep you all posted on the 5th Annual Mummer’s Walk in the New Year…. This past weekend I participated in the annual Christmas parades at St. Anthony and St. Lunaire-Griquet. Last year our float was “The Mummers”. We had an old pot belly stove painted by the very talented Charmaine and Lavinia dressed as granny, accompanied by a merry band of mummers or jannies as we often call them. This image is on the back of my MHA Christmas card this season. Christmas is certainly a special time in rural Newfoundland & Labrador, especially in our small communities on the Great Northern Peninsula. The local residents show their talents and spirit by hosting a number of activities including Christmas tree lighting, carol sings, concerts, parades, turkey dinners and other events. The St. Anthony and St. Lunaire-Griquet Christmas Paraders are no different with floats bringing out Despicable Me’s Minions, Monsters Inc., Wreck it Ralph, Mike the Knight, Elf on a Shelf, Old-fashioned Snowmobile, Santa and many others. Not to mention mascots such as Subway, Minnie and Micky Mouse, Elmo, Mummers, Clowns and more. There were many good corporate citizens, with local businesses and their employees putting hours of time into preparing for the annual parades, as well as parents, grandparents and local citizens gearing up to show the life and support that exists in rural regions. Despite very chilly temperatures there were many by-standers, especially children catching handfuls of candy that was being tossed along roadside by those on floats. The parades all ended with a visit from Santa, a warm drop of hot chocolate and many smiles as Merry Christmas was in the air.